As far as I’m aware, the original St Valentine, the Roman martyr, never touched a drop of Champagne in his life*, but for some strange reason, fizz and the 14th of February have, nevertheless, become inextricably linked. There’s something about the aura of celebration created by the pop of a Champagne cork, allied to the giggliness inspired by the rush of bubbles through the bloodstream, that makes us all want to reach for a bottle to celebrate the festival of romance. But what kind of fizz will you and the one you love be drinking on the 14th? To my mind, it rather depends on what you think you might want to eat that evening. I’ve never for a second believed that music is the food of love – I rather reckon that food is the food of love, but some kinds of food are better for love than others. Big hunks of meat are right out of the question – if you and your beloved wolf down a pound of steak each, the chances are that you’ll want to curl up and sleep afterwards rather than getting down to some serious romance. Keep it light, instead. The jury’s out as to whether or not oysters are actually aphrodisiac, but they’re definitely easy on the digestive system and are deservedly popular fare on Valentine’s Day. If you are dining on oysters this year, the Champagne of choice must be a Blanc de Blancs. The delicate flavours, light body and zesty acidity of this style makes it the perfect partner for oysters. 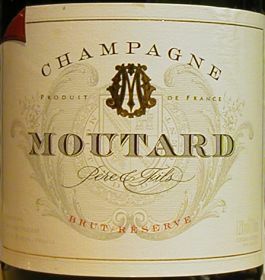 Moutard’s Brut Reserve is 100% Chardonnay, aged more than three years in Moutard’s caves. Our bottle, disgorged on 24th April 2006 pours a pale lemon/green colour, with very fine bubbles. On the nose it is delicately fruity and has an easy appeal, with a light peachiness. On the palate there is a lovely ripeness and limpid weight of pear and peach fruit, with a soft, pillowy mousse and a sense of fruit purity and roundness. There is a bit of creamy depth that develops through the mid-palate, and whilst the lemony, fresh acidity does a fine job of tightening and lengthening the finish, this remains deliciously soft and drinkable. A lovely, very easy to drink Champagne with the finesse and structure for oysters, or as a delightful aperitif. Around £17.99, See all stockists on wine-searcher.comIf you’re really pushing the romantic boat out and plan on tucking into caviar and blinis, a Blanc de Blancs is, once again, a great match as it won’t dominate the subtle, salty flavours of the fish eggs. Rosé Champagne has become increasingly popular in recent years, and because it’s flirty and fun, it’s a great Valentine’s Day drink. Richer, fuller and fruitier than many styles of Champagne, rosé is an ideal accompaniment to many Asian dishes. If you’re looking for a bit of spice this Valentine’s Day, while I’d probably draw the line at teaming it with a full-on Vindaloo, I’d be perfectly happy to match rosé fizz to most types of Chinese, Vietnamese or Thai stir-fries (as long as there isn’t too much chilli, as this will kill any wine stone dead). Rosé can even work with milder Indian curries – as can richer styles of vintage and NV Champagne. If you’re looking for the perfect rosé this year, try Billecart-Salmon – the NV is delicious, but if you can track down a bottle of the Cuvée Elisabeth Salmon it’s well worth the extra splurge. 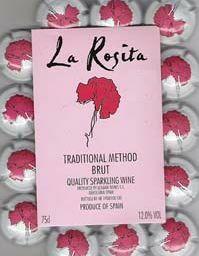 Other great rosés are Moët NV rosé and the Ruinart version. OK, not a Champage, but a delightful sparkling rosé from one of the most interesting winemakers around, Scot Pamela Geddes. Pamela gave up a career in the Scotch Whisky industry to make wine, first in Australia, then South America, and finally at her own winery near Barcelona in Catalunya. This is Pamela’s sparkling Monastrell rosé a 12.5% beauty with a pale pomegranate colour, delightfully small, persistent bubbles and a nose crammed with fresh, summery berries, a touch of briar and a delicious creaminess. On the palate it is off-dry, with super ripe berry fruit, and a character of cream and strawberry pulp. The acidity is beautifully judged, with the mousse soft yet persistent, in a really lovely wine. £9.99, Cornelius, Hendersons, Peckhams, Luvians, WineRaks.co.uk.If the idea of matching Champagne to curry brought you up short a couple of sentences ago, I’m not surprised. That, too, would have been my reaction until last year, when I got to taste the latest releases of Krug with a selection of curries. A pairing of Malabar lobster – all coconut sauce and delicate spicing – with the Grande Cuvée stands out in my memory as one of the best matches of the year. But rich, weighty Champagnes, such as Krug’s Grande Cuvée, Bollinger’s Grande Année and Mumm’s Grande Cuvée are natural matches for richer styles of seafood, whether spiced or not. A relatively plain dish of lobster (or even langoustines) grilled and then smothered in butter, partnered with a green salad and one of the above wines would be my idea of Valentine’s Day heaven. I might even be tempted to partner such a wine – especially one with a bit of cellar age – with foie gras terrine on toasted brioche. Not only do the flavours of wine and dish complement each other, I honestly think that a rich, dry wine with good acidity (such as Champagne) is a far better match for foie gras than Sauternes or other sweet wines, as I find the traditional pairing somewhat cloying and sickly. The truth, though, is that Valentine’s Day isn’t one of those occasions when you should put too much stress on finding exactly the right wine for whatever you’re planning on eating. Just enjoy whatever you’re drinking – and the moment – and leave the fine-tuning for another night. * Before anyone writes in to point out my weak grasp of history, I should own up that I was, of course, being facetious. The third-century Roman priest died long before sparkling wines became popular.